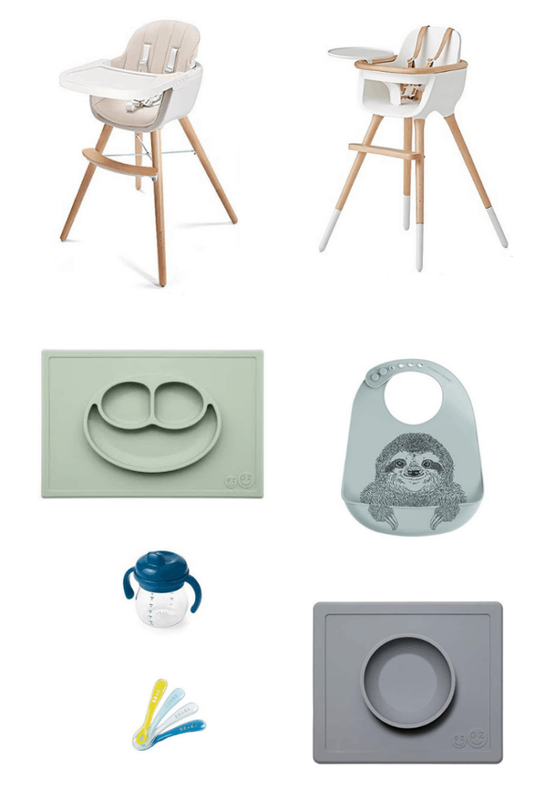 Add these modern and neutral baby products, including gear, toys, and feeding must haves, to your registry for a stylish nursery and a baby friendly home that won’t drive you insane. I’m just going to say what we’re all thinking. Baby things are ugly. Like, really, sometimes painfully, ugly. Honestly, I don’t know what most manufacturer’s are thinking when they come up with these things. They know that these baby seats and swings and play mats and high chairs are going to be permanent fixtures in our living rooms, kitchens, and bedrooms for a year or more, yet they make them as loud and obnoxious as possible. I purposely have a home full of mostly neutral, peaceful tones, so I almost had a panic attack trying to build my baby registry when all I saw was brightly colored, flashing, cartoon character-covered, plastic eye sores. Not kidding. 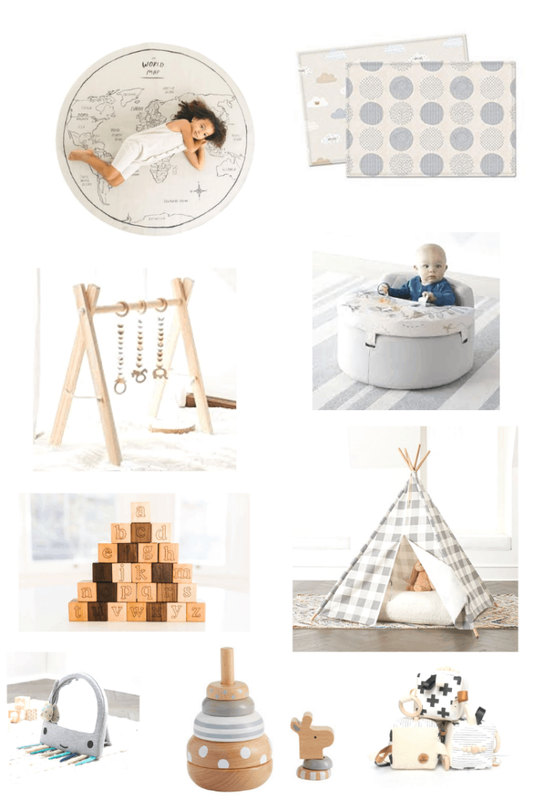 I searched high and low for soothing, modern and neutral baby products for my nursery and home when building my registry, so now I’m passing the findings on to you, just in case you, like me, are allergic to bright colors and cartoon characters make you have heart palpitations. BabyBjorn Bassinet This is the bassinet we bought and I absolutely LOVED it. It was lightweight enough that I could move it from room to room (while holding baby), stylish, and our little babe loved sleeping in it. SNOO Smart Sleeper Bassinet This bassinet isn’t the best choice if you’re on a budget, but isn’t it just gorgeous? It would be worth the investment if it matches your home and you plan on having a few babies in the future! Baby Bjorn Travel CribThis travel crib is much less of an eye sore than many, but what I love most about it is that it’s very easy to set up and break down, which you’ll appreciate if you travel (especially to grandparents’!) often. BabyBjorn Bouncer Bliss Obviously I’m a huge fan of BabyBjorn products. I absolutely love this bouncy seat. Baby fit in it around 3 months, and still fits at almost a year. She loves hanging out in it and watching me cook or watching TV while I shower. This seat is super easy to fold up and take with you any where, too. An absolute must! Angel Care Bath Tub Ok, what is with all the bathtubs being super bright? I love this simple one. We put it in our farmhouse sink to give baby a ‘shower’ bath it works perfectly! The little holes make it dry quickly, too. Joovy Spoon Walker This is literally the only walker I could find that didn’t look like a circus was going on around it. It folds up easily, there are 3 adjustable height levels and a removable tray (if your little babe loves to eat as much as ours does! ), so I definitely think it was worth the mini investment. Asunflower Modern High Chair We registered for a different high chair that’s modern and perfectly fits our home. However it has been recalled and is no longer available, but I found a couple of similar high chairs that I think are really cute, too. This one has removable padding, similar to ours, which I love! Ovo Max High Chair This modern high chair is sleek and stylish, too. It would look great in a more midcentury modern kitchen (that’s the style of our dining furniture, and I love how ours fits in next to the table). EZPZ Silicone Divided Placemat EZPZ mats are great for new eaters. They’re easy to clean and grip to surfaces so that kids have a harder time getting them on the ground. This divided one is easy for mom, and how cute is the sage color? Modern Twist Pocket Bib Pocket bibs are WHERE IT’S AT for babies learning to eat! Baby can scoop up any dropped food from right in the pocket, and they make cleanup SO much easier. I made an exception to my character rule for this bib, because the sloth is really cute. OXO Tot Transitions Sippy CupThis is one of the very few sippy cups that isn’t an obnoxious color. GET IT. This is the first cup we used with baby, and she had an easy time with it. It comes with interchangeable sippy and 360 lids and removable handles so you can transition from sippy to 360 to open cup. Beaba Second Stage SpoonsThese spoons are my favorite for baby led weaning, or if you have a more advanced eater. They’re easy to grip and perfect for my teething babe to chew on, and the actual spoon part is shallow enough that she can get the food off and into her mouth. I got the light pink one first, then loved it so much that I ordered this blue set, too. EZPZ Silicone Placemat Bowl This is the smaller bowl version of the EZPZ mat. It’s great for cereal, yogurt, oatmeal, and other meals that you don’t need the divider plate for. I have the grey and just love it! Gathre Play Mat Gathre leather play mats are THE best. They’re all very sleek, neutral and stylish, and they come in so many sizes. The leather material means they are easy to clean and super durable. Baby is on her play mat in the living room constantly, so if you don’t have a rug or carpet your babe can play on, you’ll want a mat that you don’t hate looking at. Parklon Blue Play Mat This reversible play mat is another good option that’s easy to clean. Wooden Baby Gym I couldn’t bear most of the bright colored baby play gyms, so I ordered one of these modern wooden ones, and I love it! It’s sleek and neutral colored so I don’t mind it being left out in the living room. Baby loves playing with the dangling toys (I ordered these ones from Amazon). Baby Activity Chair These activity chairs from Crate & Barrel are soft colored, comfy and so cute for baby to sit in and play! Crate and Barrel is one of the few retailers with mostly very cute baby stuff. Bannor Toys Wooden Blocks I absolutely LOVE all of the toys I have from Bannor Toys, from the alphabet blocks, to the teethers, to the puzzles and push toys. The wooden toys are handmade in America and are such good quality. They are my absolute favorite of all baby’s toys. Buffalo Check Teepee This teepee is totally going on baby’s birthday list. How adorable is it for littles to make forts, read, and play in? Tummy Time Octopus Mirror Baby HATED tummy time (and still does, really) but she LOVES looking at herself in the mirror, so a tummy time floor mirror was essential for us. It was extremely difficult to find one that wasn’t completely awful to look at. This one is cute and simple, but still has enough fun stuff for baby to play with. Wooden Giraffe Stacker Another wood toy! This cute little giraffe is wooden with nice neutral accents. Way cuter than the plastic rainbow ones, don’t you think? Cloth Sensory Block Baby LOVES this sensory block that has all kinds of fun ribbon tabs (she’s obsessed with tags), multiple patterned sides, and a wooden teether ring. There are several color palettes and patterns to chose from. There you have it! A small list of baby things that won’t make you want to poke your own eyes out. 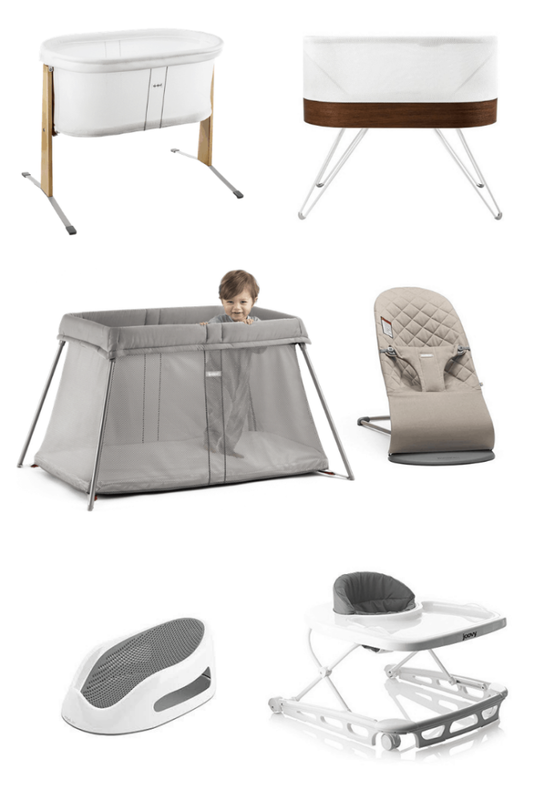 If you want a general direction, PB Modern baby and Crate and Barrel are always good places to start with a good variety, and I also highly recommend BabyBjorn!